The buyer found out that the barrel had an almost undetectable hair crack which I had missed. Buyer returned pen to the retailer who sold me the pen just a month earlier – a very good retailer that accepted a warranty claim without fuss. So, I got a new Delta Profili instead. I had planned to sell it straight away to keep the pen budget in check, but when it arrived I just couldn’t sell it. It was so beautiful – the combination of the candy, lustrous blue and silver is divine futurism. The first one (the red) had feed issues. 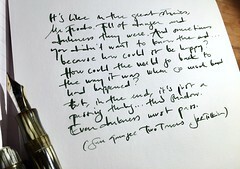 A smooth nib that wouldn’t let go of any ink. Retailer and nibmeister fixed it and after this fuss it wrote just like a dream. The blue/silver version laid down a perfect line straight out of the box. I was surprised to find that they differ a little bit from each other (not only colour wise). The blue only has guilloche each other side on both barrel and cap – where the red is patterned all over; except for one side of the cap where the brand name is engraved – in a futuristic, ultra cool typeface . On the blue pen the brand name is engraved on the barrel instead. They also have different nibs. The red one has Delta’s old logo and style and is in 18 k gold, while the nib on the blue is in 14 k gold and wears the newer logo. I prefer the blue Profili’s characteristics, but the unengraved sides on barrel and cap makes it less practical and prone to get scratches and dings if one isn’t careful. A little bit of patina can be beautiful, but too many scratches makes the pen look dull and this is a too lustrous and sparkling pen to benefit from that kind of dullness. But cool design aside – this pen is a real great writer. Smooth, but not slippery smooth. Well balanced, at home in my hand. Very comfortable for long writing sessions. I also like that the cap posts by screwing it onto the end of the barrel. In all a favourite. I realize that I think that all of the pens I’ve got now belongs to my favourites. 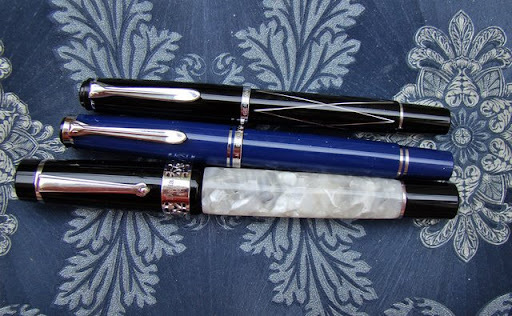 I’ve sold all (expensive) pens that I didn’t feel that I was perfectly happy with. I haven’t regretted one of these sales – it only feels good to let go of things that are good and OK, but not right. It is so easy to end up with a lot of things that doesn’t mean anything special or fill any function (one function can be looks and another to make me happy an a third to be a real great writer). A review of the red with more photos can be found here. This entry was posted in delta, fountain pens, pelikan, pens, reviews, writing and tagged delta, fountain pens, pens, photo, review, reviews, writing. Bookmark the permalink.